RWAKITURA — Since the general elections of last year February we have had seven Parliamentary by-elections. The NRM its organizational weaknesses notwithstanding, has won five of the seven. The NRM has won: Kamuli Municipality, Kagoma, Moroto District Woman (unopposed), Toroma and Upper Madi-Okolo. It has lost Aruu North and Kyadondo East to Independents. I congratulate all those who were elected, including the two Independents (Lucy Aciro of Aruu County North and Robert Kyagulanyi, aka Bobi Wine of Kyadondo East). 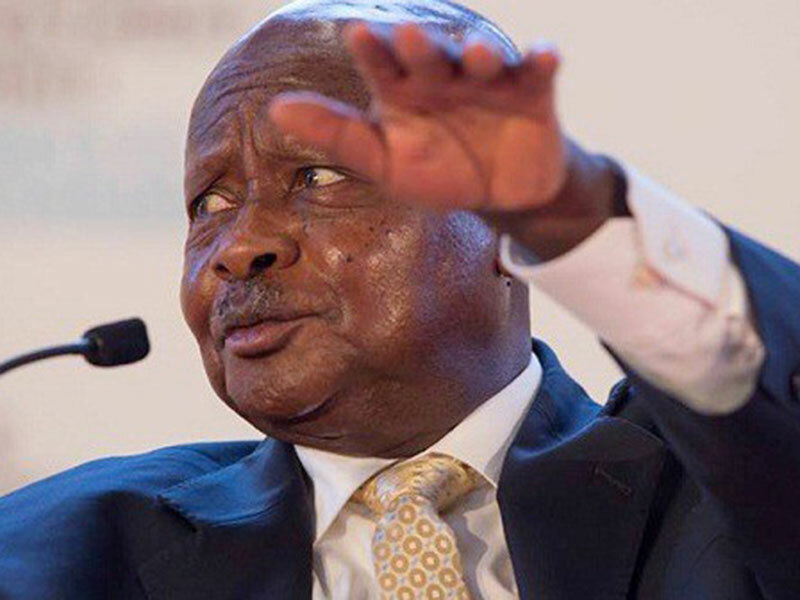 The NRM wins most of those electoral contests, ever-since 1993 when we had Constituent Assembly (CA) elections, mainly because of the spontaneous goodwill of the population towards the Movement on account of its contribution to security and the economic recovery of the country. The NRM vision is correct and if only the NRM leaders and the civil servants could vigorously implement its programmes, the gaps that are still there would also be covered. The gaps that have emerged are: jobs for the large youth population, fighting corruption of public servants and politicians, some hike in crime and leaders not connecting with the population, particularly the youth, sufficiently. Some of the gaps are a result of the success of the NRM programmes. Take for example, the large number of youth, many of whom have the basic education of UPE or higher. This is as a result of the NRM programme of immunization that I launched with Dr Ruhakana Rugunda in 1987. Dr Rugunda was the Minister of Health at that time. The infant mortality has, as a result, dropped to 43 per 1,000 babies born alive in the year 2016 compared to 156 per 1,000 babies born alive in 1986. That is how our population has jumped to almost 40 million people today. It was 7 million at Independence and 16 million in 1991. Few populations in the world have grown faster than this throughout human history. I am told that only the populations of Yemen and Benin have grown faster than this population. This is definitely the success of the NRM. It is the slow pace of creating jobs for them that is at fault. What caused the slow pace, especially in the past, was the wrong budgeting after 1990 when the Ugandan economy started recovering. The wrong budgeting takes the form of scattering resources everywhere (kumemeerera, keto, kumansamansa, aisiarisiar) and trying to be everywhere but end up being nowhere. However, in 2006, I put my foot down and insisted on prioritizing the roads and electricity. As a consequence, the budget of the Ministry of Works went from 398.2 billion shillings to 4,587.3 billion shillings today. The one of energy went from 178.9 billion shillings to 2,319.8 billion shillings. As a consequence, we have many new tarmac roads and more electricity. If it was not for the mistake of Bujagali, which we are solving, the price of electricity would be, by now, lower, especially for manufacturing. It is these more factories that will create jobs for the youth. All the NRM leaders should concentrate on this and so should the youths themselves. Anybody who fights or delays factories is an enemy of the youth. You go to the RIHAM factories in Kawempe and see how the 400 youths there are happy. With the more and cheaper electricity, it is those experiences that we shall proliferate. The NRM leaders and the RDCs everywhere, need to engage all the youth groups and explain this to them. This is apart from everybody in Government knowing that more and more factories are the future for the country. Fortunately, we have the natural resources. We have been lacking electricity. We now have it. The NRM leaders should also concentrate on the implementation of the other mass-oriented programmes: Universal Primary Education (UPE), Universal Secondary Education (USE); the Youth, the Women, the Innovation, the NAADS and the SACCO funds. Why should an MP or any other leader tolerate the violation of the UPE policy by allowing the charging of illegal school charges when the families cannot yet afford? How many times have I talked about this? It is when the NRM leaders choose to stand with the parasitic elite that people, including the youth, move away from them. When the NRM wins the by-elections, the Press, including the New Vision, are not happy. They do not talk about the victories. It is when the NRM loses that the Press is happy. The radios, the newspapers devote alot of space and time. Yes, the youth in Uganda today are 78% of the population, thanks to the Uganda families who are not lazy to have babies and the NRM that has improved some aspects of the health services and created security for those children, including the street children, to grow up, the social-economic problems they face notwithstanding. It is to the credit of the NRM that our slum-dweller children can today even make it to Parliament because those avenues are there. Nevertheless, our esteemed editors and news persons need to know that when we talk about the management of society, we are not talking about biology only but also about ideology. What is the ideological position of those youth or those elders? Youth or elders are biological categories. They will not help society by themselves. It is only when they espouse correct and accurate viewpoints vis a vis society, vis a vis the world, that they become part of the solution. When Kabaka Mwanga slaughtered the new believers in 1885, he was 17 years old. He was a youth. At Independence in 1962, almost all the actors were youth. Mutesa was 38 years old, Obote was 37 years old etc. Some of the Ministers such as Ibingira, Nekyon etc, were 28 years old. Idi Amin at Independence was 37 years old. John Kakonge (who was UPC Secretary General at the time) was 26 years old. Belonging to the biological category of youth did not help them to solve the problems of the country. By 1966, the country was in a crisis. In our own time, we were, of course, biologically youth. However, we took different ideological positions. Quite early on, by 1965, the youth I belonged to ideologically, took a position that, eventually, evolved the four principles of the NRM: patriotism (anti-sectarianism); Pan-Africanism; social-economic metamorphosis; and democracy. The other youth took the ideological position of sectarianism, parochialism and subservience to foreign interests. Some of the youth on the other side joined the State Research and the UPC young supporters that were committing crimes against the population were actually called “Yusi” (youth). Our respective positions were, eventually, tested in the field of battle (two wars ? 1971-79 and 1981-86). Those who preached patriotism, who preached Pan-Africanism etc., won at a high cost. Uganda recovered and built institutions following some of those principles. When our principles are followed, we succeed. Where they are not, we under-perform. It is, therefore, a pity to see media houses (including the New Vision) not helping our Youth to find their bearings. The African people need prosperity and security. The NRM’s conclusion, after many years of study, is that it is the four principles that are and will guarantee these. Uganda already has peace for the first time in the last 500 years. It is because of some of the youth of the 1960s and 1970s that took a correct ideological position. What are these media houses telling the youth of today? The newspapers (including the New Vision) are telling our youth that biology is enough. Well, biology is not enough. It must be biology and ideology. Which ideology, then? Progressive ideology or reactionary one? Back to the by-elections, there are some bad practices that I saw in Kamuli and Kyadondo that should not be repeated. 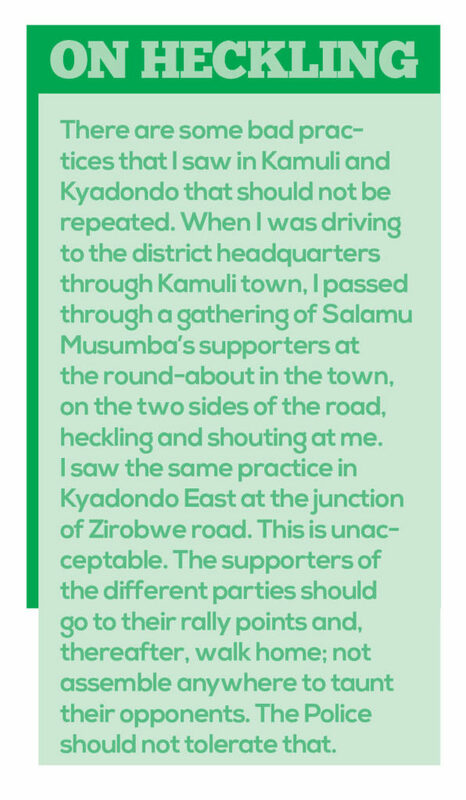 When I was driving to the district headquarters through Kamuli town, I passed through a gathering of Salamu Musumba’s supporters at the round-about in the town, on the two sides of the road, heckling and shouting at me. I saw the same practice in Kyadondo East at the junction of Zirobwe road. This is unacceptable. The supporters of the different parties should go to their rally points and, thereafter, walk home; not assemble anywhere to taunt their opponents. The Police should not tolerate that. The turn-up was low in some of these by-elections. Was it due to intimidation? Now that Uganda has the base (electricity, roads, etc.,) to industrialize, let us not waste time. Finally, the NRM actors should go back to our history and understand how we built up the NRM. By 1968, when I was 23 years old, I was in Katwe with the youth of the area that included Zubairi Bakari, Haruna Kibuye, Kabara, Mayanja, Kalyesubula and others. I was in Kibuli with older persons like Abbasi Kibazo. This was in very difficult and, even, dangerous circumstances. Why should the present NRM actors fail to connect with the youth in these urban centres or the rural ones? Do not tell me about money, please, because I had no money at all in 1968 when I was mobilizing these people. It is just understanding the vision of the NRM and passing it on to the masses painstakingly and patiently. The politics of Uganda is evolving very well, in fact. The electors are beginning to lose interest in those who were exploiting the opportunistic issues of identity of religion or tribes. The NRM has been defeating this opportunism ever-since 1993, the elections of the CA. Now, however, even those who have been inclined to the anti-NRM positions are abandoning that politics of identity. That is how the likes of Kato Lubwama were able to retire the likes of Kenny Lukyamuzi who was the epitome of that type of politics. Even the money users for elections are getting out of business. The Ugandans seem to rightly want involvement, wealth creation, service delivery or, at least, timely explanations in case of any shortfall. This is the type of politics that NRM should excel in. It is now the task of the NRM leaders at all levels.